I feel like I'm somehow rooting for a football team that's playing with these nails. Then again, I also just feel happy because there's so much shiny to the whole manicure. Shiiiny! You're being blinded by I'm Not Lion and Man Hunt. Pretty huh? You can pick up 12 different colors for about $7.50 from Born Pretty Store right here. Don't forget to use my coupon for 10% off your whole order: C10X31. One more thing, it's free shipping!!! This is so pretty! lmao I love the gif!! This is genius! I have to try it one day! Oh I love this. I always find it really difficult to apply striping tape in perfect alignment like you have. I love the colour combo too. Wow, it looks really beautiful, I love it! Woooooo!! Beautiful! Love the combination! Gorgeousss! 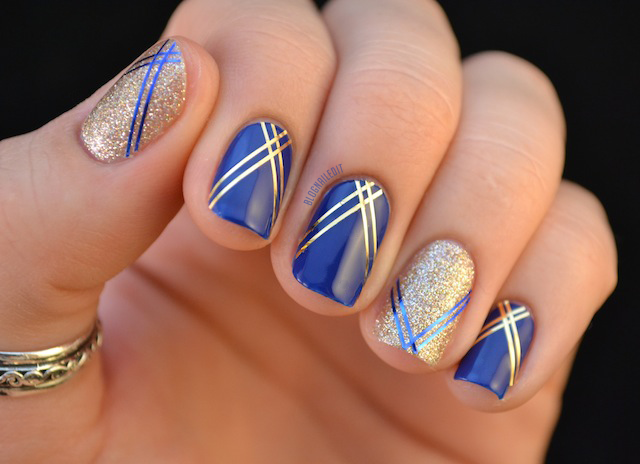 I love how striping tape can totally transform a mani! This mani is beautiful!!!! You come up with the most classy designs!! Your blog has made me fall in love with striping tape! I've never used it, but I placed an order with Born Pretty yesterday and I can't wait until it arrives! And for anyone else interested in purchasing it: I spoke with a lady at Born Pretty who said the striping tape is 20% off ($7.19 USD instead of $8.99 USD), and because of the new price, the discount code will not work unless you have another item in your cart. I just have to say that you have got to be the best nail blog ever! this is SOOO beautiful. alot of the striping tape manicures i see look really messy, but yours is perfect and the colors are as well!